After Andy was asked by the Official Arsenal Magazine to argue for the greatest manager – Herbert Chapman – I was requested to give my thoughts on the Greatest Arsenal Goalkeeper in the April 2016 issue. Now, a definition of “greatest” doesn’t necessarily refer to the best player, it can also mean someone who has done great things. 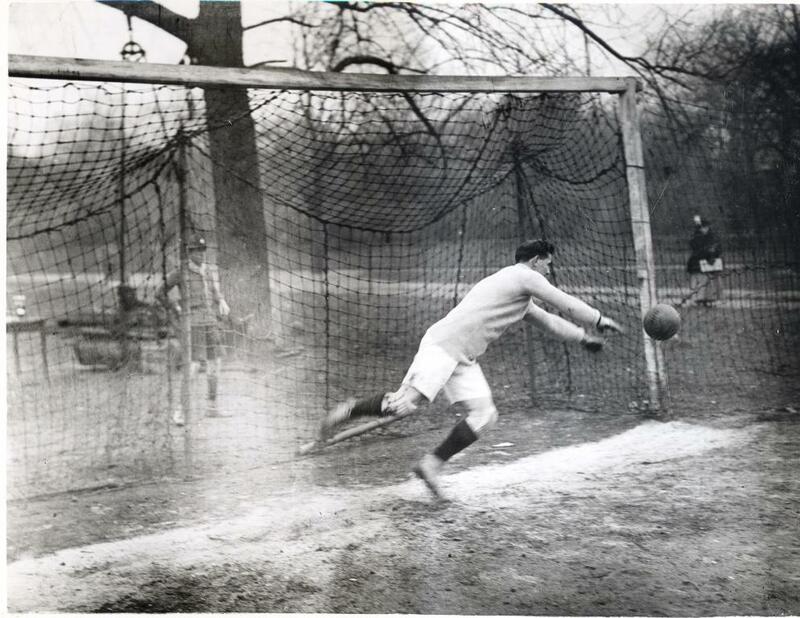 Which was why I chose our first goalkeeper after World War 1 owing to his work with servicemen blinded during the war. The predictable path would have been to pick a modern goalkeeper like Seaman, Wilson, Rimmer, Lukic or Jennings but that has been covered many times over in official and unofficial publications and websites. Ernie Williamson saves from a blind player’s spot kick. Photo courtesy of the Blind Veterans UK – Rob Baker. EC Williamson showed the human side of the Arsenal in a period where the country was in recovery from a great upheaval and one of effective torpor for the club. 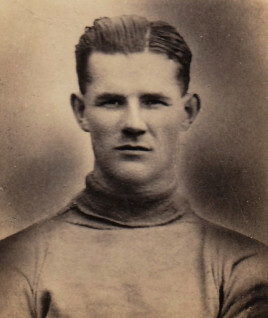 Ernest Clarke Williamson was the first keeper to play for England while the club was at Highbury, and overall the second English international Gunner keeper after Jimmy Ashcroft. Williamson was the first in a very long line of top quality international Arsenal goalkeepers at Highbury; from Moss, Swindin, Kelsey, Wilson, Rimmer, Jennings, Seaman to Lehman. Ernest Clarke Williamson moved to Arsenal from Croydon Common just after WW1 for £150 having played as a guest in 122 wartime matches for the Gunners. He made his competitive debut in the first top flight game Arsenal played at Highbury and over the next few seasons appeared 113 times for the Gunners. Chosen for England he made two appearances on a tour of Sweden in 1923 just before moving to Norwich, and after he finished playing ran a couple of pubs. He won no FA cup nor League medals while at the Arsenal as this was the pre Chapman era however one element marks him out as great which transcends his playing career. That was his work with the St Dunstan’s blind servicemen between 1920 and 1923. Now called the Blind Veterans UK, the St Dunstan’s charity was set up in Regents Park during the Great War to care and provide services for approximately 3,000 soldiers, airman and naval rankings who lost their sight while fighting for their country. He would often play in goal in the football events organised by St Dunstan’s for blind veterans in their care at the Regents Park football pitches. These games regularly played for the Sir Arthur Pearson Challenge Cup final were made up of teams of blind players in a tournament. There would be a sighted keeper and the Challenge Cup was usually a series of knockout penalty shoot outs, with the keeper clapping his hands to indicate his position. Williamson presented with his rose bowl from Sir Arthur Pearson. Photo courtesy of the Blind Veterans UK – Rob Baker. 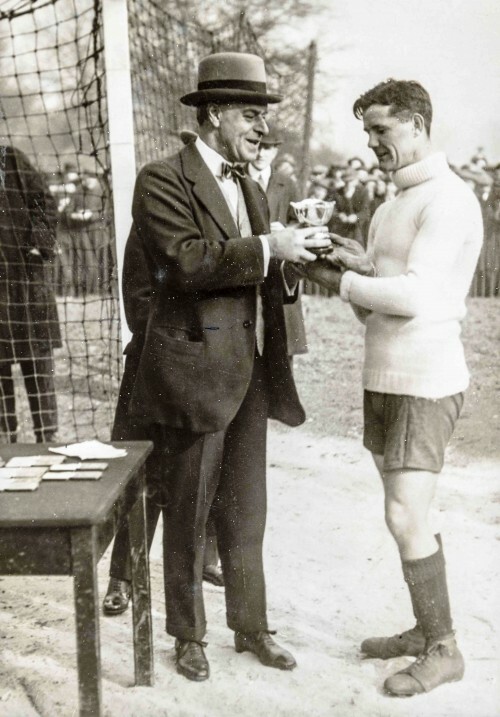 The men bought him an inscribed rose bowl as a token of their appreciation in 1921 as he had twice arranged for the whole Arsenal team to play blindfolded against eleven veterans at Regents Park. Arsenal won 4-0 and 5-3. It is not recorded why he was so involved though he enlisted into the Footballer’s Battalion in December 1914, and no doubt came into contact with the seemingly endless misery of the awful conflict. Williamson may well have been moved to assist after playing in the friendly against Spurs in May 1919 which the two clubs arranged to raise money for St Dunstan’s. EC Williamson: Arsenal’s first Highbury international keeper and a decent man too. We will in due course publish a full account of his and Arsenal’s work in assisting the St. Dunstan’s Hostel for Blinded Soldiers and Sailors in the early 1920s. thanks and I watched him in a video. He is the goalkeeper with the white shorts and black socks at about 26 seconds in. That’s another great story and another piece of history about a player next to nobody would have any knowledge about. Thanks again for sharing. Very interesting and a new name entirely for me. Needless to say he ended up running a pub ! He ended up running two pubs! …And obtained a nickname of Tim from Norwich fans when they signed him. I had the pleasure of corresponding with his son while writing the extended version which will be on the site next month. I love this kind of insight into Arsenal’s past provided by you and Andy. We all get caught up in the need for results, and the constant debates – Arsene in Arsene out, who will we sign and the rest. I am as guilty as anyone. It can be easily forgotten that the Club throughout its history has been home to some extraordinary people that have enriched and made The Arsenal what it is. Thank you for shining a light on them. Thanks Paul. Yes, it’s so easy to get caught up in the bickering and point scoring that the club’s fantastic history isn’t celebrated.